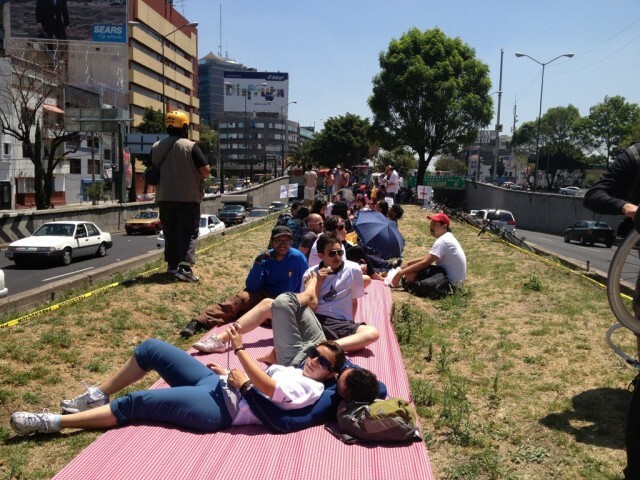 Picnickers urbane in Mexico City reclaim a freeway median. Photo by Ben Welle. Tactical urbanism, or “D.I.Y. urbanism” is the small scale- and usually low cost- implementation of urban improvements in the public space. Mike Lydon, one of the co-authors of Tactical Urbanism, elucidated the so called “pop-up” urban revitilization projects yesterday as part of an EPA sponsored lecture series on smart growth. These citizen based construction projects use relatively low cost tools and materials to transform underused spaces. Projects run from simply resurfacing an underused street with gravel to turning a parking spot into a parklet, but the goal is unified across forms: reclaiming land from cars for people. The tactics of D.I.Y. 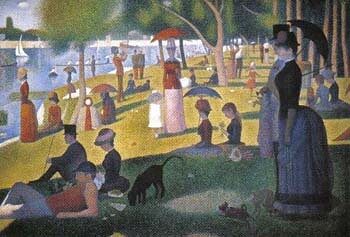 urbanism are similarly diverse. Lyndon highlighted the successes of unsanctioned guerrilla urbanism, which frequently gain political support. When a D.I.Y. urbanist mounted walking distance placards, noting the direction and duration of a walk to a landmark, the City Council eventually adopted the placards as official signage. Citizens in Dallas, Texas turned a near-by abandoned stretch of road with three empty one way vehicle lanes into a smaller car lane abutted by bikelanes, with plenty of room left over for a pop-up cafe. Though no permit had been filed, people came out and populated the abandoned street… as did the local city councilperson who ultimately approved it. Though guerrilla infrastructure projects are perfect examples of interactive, “results oriented” urbanism, examples of responsive civic services exist happily in tandem with DIY urban revitilization. Perhaps the most photographed urban place on earth, Times Square in New York City, went from mostly car traffic to lawn chairs. NYCDOT Commissioner Janette Sadik-Khan and her team rolled out one of the most successful space reclamation projects in the world, turning Times Square into a public plaza along with dozens of other spaces across New York City, in tandem with bike lanes. San Francisco has reclaimed its roadside parking spots and underused rights of way, turning them into “parklets” that open asphalt to seating, landscaping and a new urban experience. While gaining significant momentum across America, tactical urbanism is not unique to the US. Reclaiming streets for people occurs on a weekly basis for one-and-a-half million cyclists and pedestrians during Bogotá’s Ciclovía. The weekend event closes traffic to vehicles and lets urban dwellers and travellers alike cruise the streets sans motorization. More permanent changes in land use also exist in Latin America. Urban activists have reclaimed what was a freeway median and transformed it into picnicking greenspace in Mexico City – making space for a contemporary urban afternoon in the city. Tactical urbanism does have its challenges. Unsanctioned, thereby unlawful, road improvements impose an official legal barrier to change. Communities that do not feel that seamless legal and political co-option (such as the local city council person vindicating ad hoc bike lanes) may not be willing to take the risk in adding a DIY crosswalk. Action in spite of these legal barriers is a testament to just how strong the need for pedestrian infrastructure is. Tactical urbanism generally “raises the profile of creating livable cities…of creating more pleasant public spaces,” according to EMBARQ Health and Road Safety Assistant Project Manager Ben Welle. Whatever tactical urbanism improvement is made, changing the streetscape to reflect both an urban past and a walkable future highlights the demands of citizens and the mandate for government action. Friday Fun: Swimming To Work In London?